Algae Removal and prevention: Algo Bio Inhibitor is an effective, non hazardous, ready to use product which removes and inhibits future growth of green algae, organic matter and micro-organisms on a multitude of surfaces. It is widely and successfully used by both private contactors and local authorities for paths, driveways, roofs, fencing, steps. 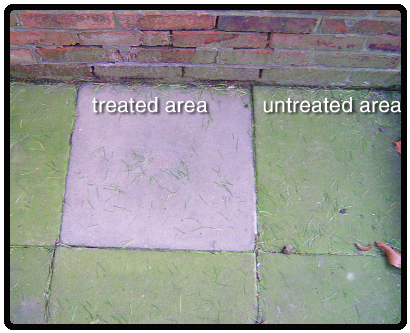 Algo treats and prevents slippery paths and steps. Algo is a non hazardous ready-to-use product that will effectively remove and inhibit future growth of algae, organic growth, and all micro-organisms on a multitude of surfaces. Algo has the unique ability to prevent regrowth for a period of up to 3 years.